Sooner or later, as they say, everything has to go. (And if they don't say that, they should!) So here, in no particular order, are a few things that left their mark on The City before making the big bye-bye. THE METAL ARCHES ACROSS FILLMORE ST. 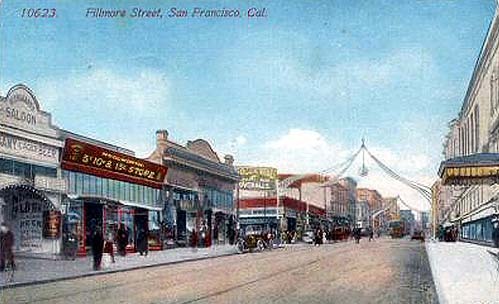 In the years following the 1906 earthquake, the merchants along Fillmore attempted to make their street the trendy area to shop. 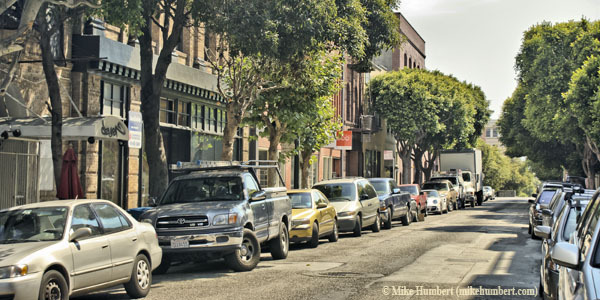 As part of this campaign, ornate steel arches were installed over fourteen Fillmore St intersections. Fillmore never caught on as a shopping mecca. During a World War II scrap metal drive, the arches were torn down and donated to the cause. 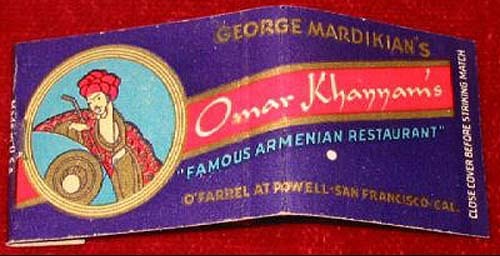 With its distinctive architecture and green tilework, Omar Khayyam's was a San Francisco favorite for decades. The restaurant is long gone, and for some time the building sat vacant. 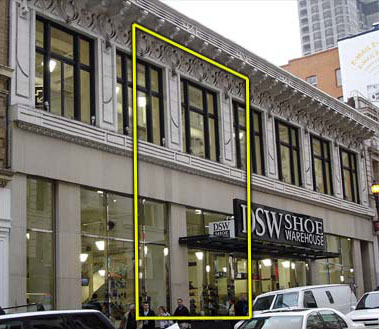 A few years ago, however, it was completely renovated and transformed into valuable retail space, as shown in the bottom photo. 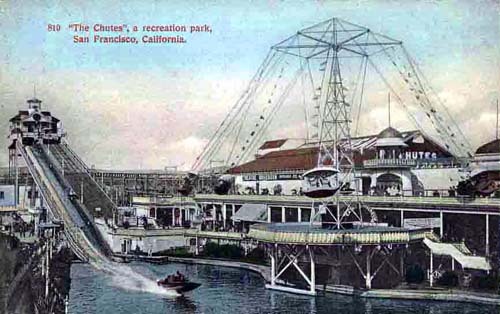 "The Chutes" was an amusement park that originally opened in 1895. Over the years, it moved a few times, eventually being incorporated into Playland-at-the-Beach. The attraction was demolished in 1950. The postcard below (photographed around 1905) shows the 350-foot waterslide at the Fulton St location. Quick! How many women are in the group shot? 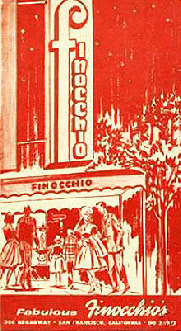 For over sixty years, Finocchio's was a world-famous venue for female impersonators. It closed it doors in 1999. 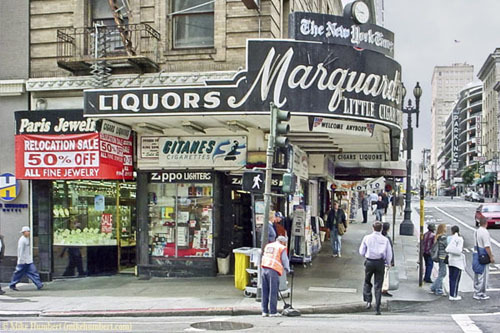 Below is a picture of Marquard's, as it looked before it closed in 2004. A landmark for decades, it was where to go to pick up a quick pint of whisky, a cheap cigar and a racing form. Skyrocketing rents forced it out, and these days, a hat shop occupies the space. The famous sign intact, but, sadly, they’ve removed the WELCOME ANYBODY that used to be above the entrance. Too bad – I always liked that. If you feel like creating a little trouble, go into the hat shop and take a snapshot or two. I can tell you from personal experience, they hate that! 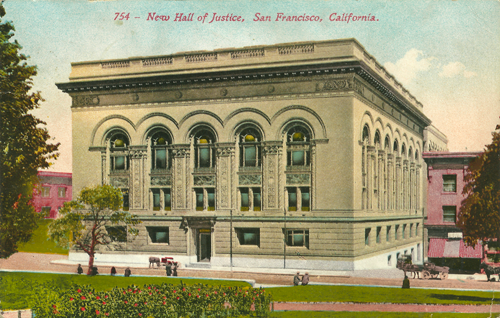 In the days of Sam Spade, San Francisco's Hall of Justice stood on Kearny Street, across from Portsmouth Square. TV buffs may recognize this building from Raymond Burr's old cop series Ironside. Today, a high-rise hotel occupies the space. An elaborate world’s fair, the 1915 PPIE was ostensibly to celebrate the opening of the Panama Canal, but was also designed to show the world that San Francisco had bounced back after the 1906 earthquake. A storybook city of dazzling palaces was constructed on new land created by filling in part of the bay (what is now the Marina District). 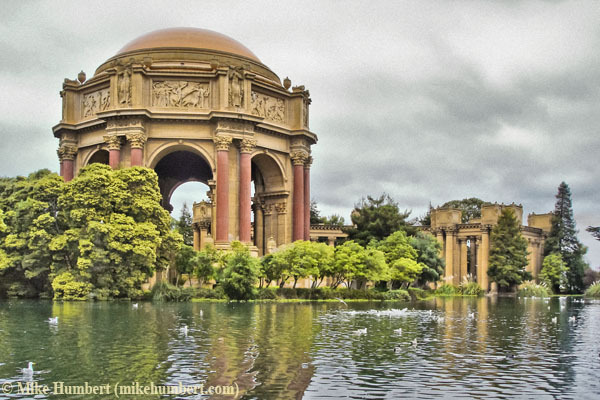 All that remains today is the Palace of Fine Arts, and even that is not the original. The original Palace, designed to stand for one year; was in terrible shape half a century later, when it was recreated, this time in durable concrete. No, not that White House. 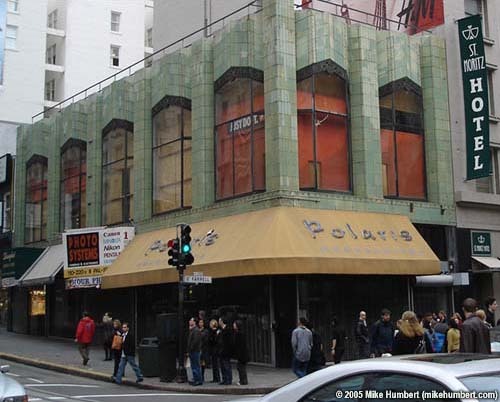 This one was a major department store at the corner of Sutter and Grant. 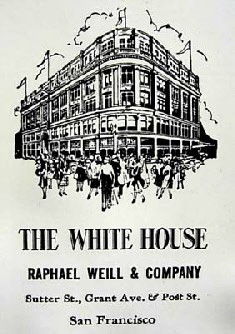 The White House was so successful in its day that it eventually annexed every other building on the block, much as Macy's has done today. It closed in 1965. Although the outside of the building looks much the same today, the upper floors have been converted to a parking garage. 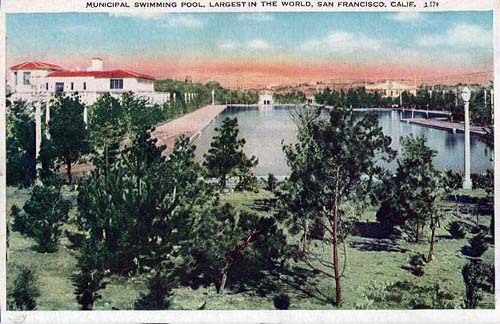 It was supposedly the world’s largest swimming pool when it opened in 1925, so insanely huge that the lifeguards patrolled in rowboats! But San Francisco (especially right alongside the Pacific) makes for chilly swimming weather. Long story short: Bulldozers filled in the pool during the 1970s. 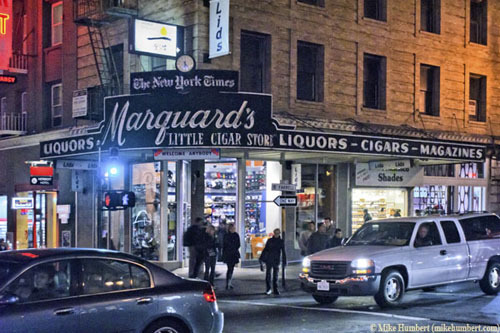 Throughout the 1940s, people joked that the best restaurant in San Francisco was in Oakland. Then, in 1951, Victor Bergeron brought his popular Oakland eatery into San Francisco. As a location, he chose (of all places) an obscure alley called Cosmo Place. 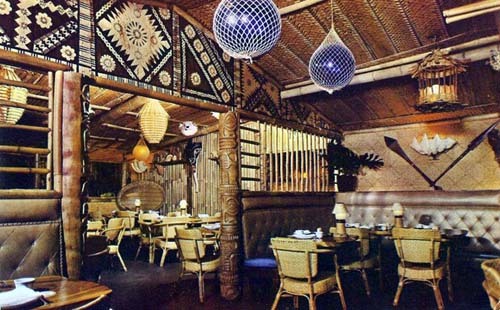 The Tiki-themed restaurant and bar soon became a San Francisco legend, attracting both the famous and infamous. Imitators immediately sprung up. After Bergeron died in 1984, things were never the same, and Trader Vic's eventually passed into history. The building in Cosmo Place is currently occupied by an upscale Vietnamese restaurant. In the 2000s, a new incarnation of Trader Vic's appeared on Golden Gate Avenue. Reviews were mixed, and it only lasted a few years before closing. Built in 1912, this Mission Revival-style depot was razed in the 1970s. Rumor has it that the bells in the towers were actually wooden fakes! 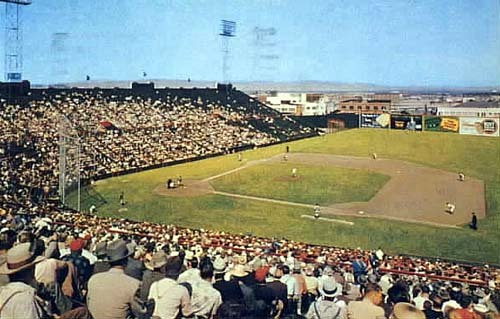 The San Francisco Seals (Pacific Coast League) played here from 1931 to 1958. The newly-arrived Giants took over tenancy during 1958 to 1959, while waiting for Candlestick Park to be completed. Seals Stadium was demolished shortly after. 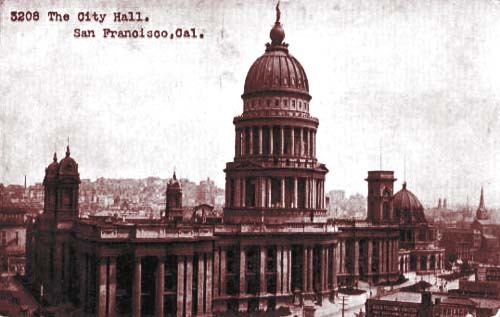 Before the 1906 earthquake, City Hall stood roughly where the new main library is today. This strikingly ugly building took almost 40 years to complete under several administrations, using a variety of materials and architectural styles. Despite this (or because of this), it collapsed during the first moments of the earthquake. 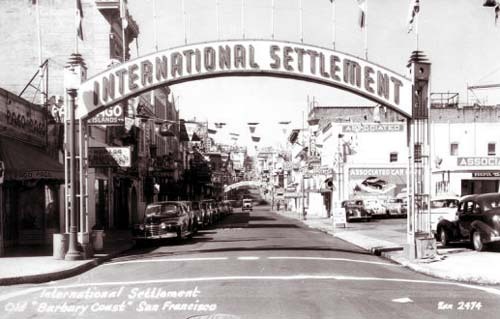 The International Settlement was the “official naughty section” of town during the 1940s and 50s. 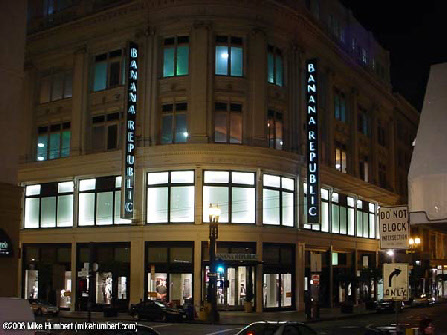 Nightclubs, bars and girlie shows filled the single block of Pacific Avenue between Kearny and Montgomery. Today, fragments of the poles that once supported the archway remain, but all other evidence has been erased. 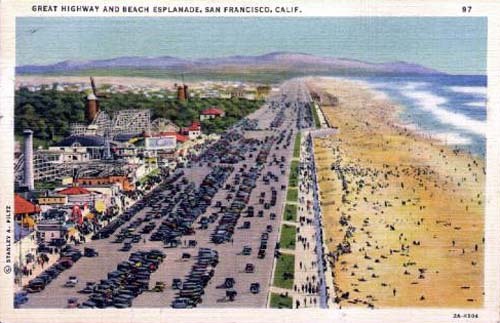 Debuting in 1928, Playland was San Francisco’s answer to Coney Island. For more than forty years, it was a family favorite, but by the 1960s, times and tastes had changed. Playland was razed in 1972, leaving not the slightest trace. For many years, the sidewalk on Powell Street was partly blocked by the bow of a ship! 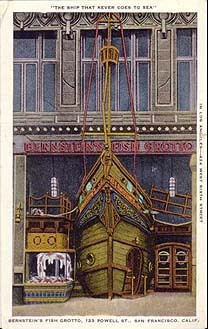 This was the unusual entrance to Bernstein's Fish Grotto. The interior of this famous restaurant was also decorated to resemble a ship. 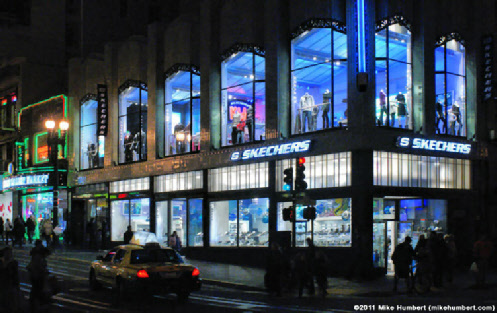 The building still stands, but is now retail space. 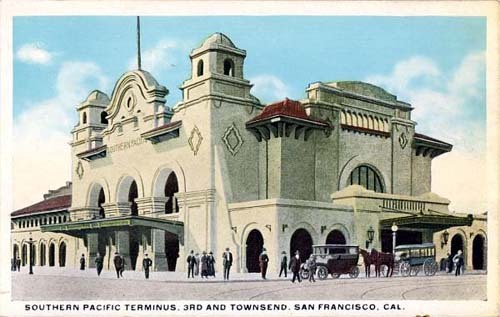 The yellow outline indicates the same area depicted on the postcard. 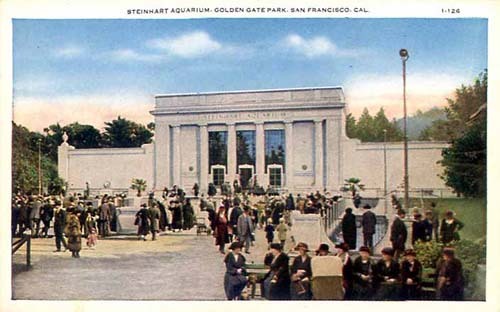 The 1939 Expo was held on Treasure Island, which had recently been created from soil dredged from the bottom of the bay. 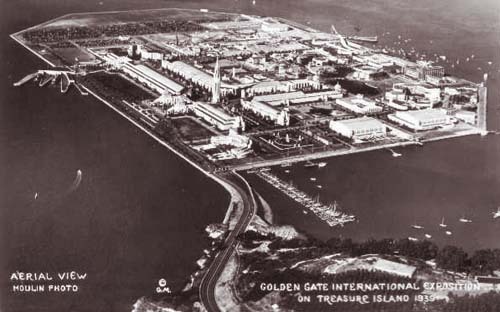 Following the end of the Exposition in 1940, Treasure Island became a Navy facility. The base closed in 1997. 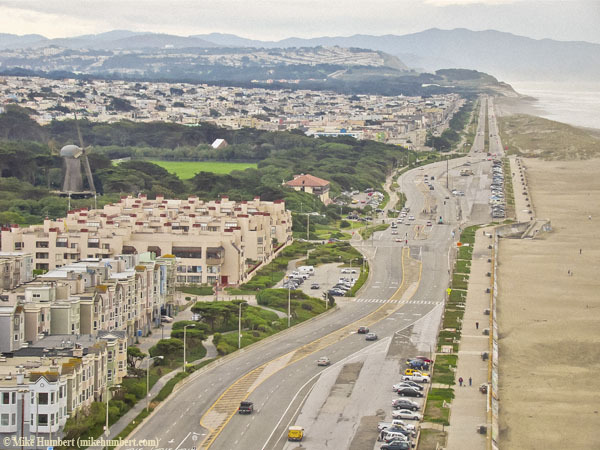 Treasure Island is, if things go as planned, in the process of transforming itself it an upscale residential area. 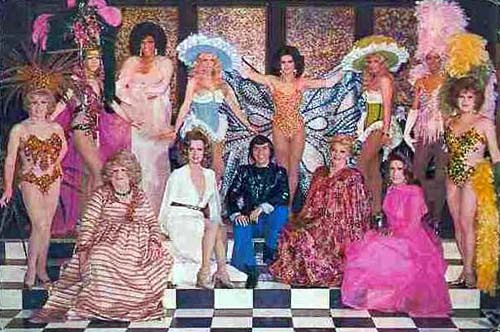 Throughout the Big Band era, The St Francis Hotel’s Mural Room was the place to see and be seen. (By all accounts, it had terrible acoustics and worse ventilation.) 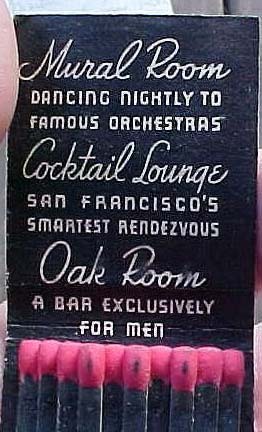 But swing bands were considered corny by the late 1960s, and the Mural Room shut down. 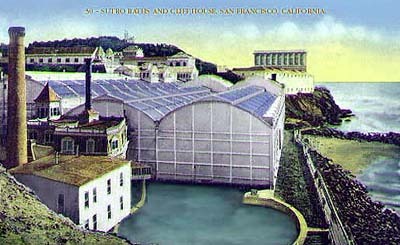 Gazillionaire Adolph Sutro opened the Sutro Baths in 1896. 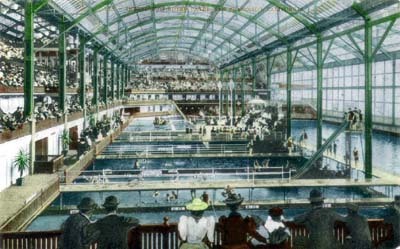 An elaborate glassed-in public swimming facility, the Baths piped ocean water into the seven separate swimming pools, each of which was heated to a different temperature! There was also a museum, and (in later years) ice skating. 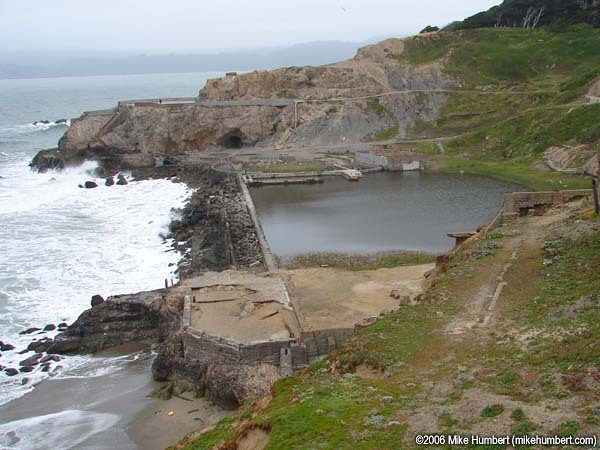 A popular attraction for decades, Sutro Baths eventually fell out of fashion. The entire complex burned down in the 1960s, leaving nothing but a big watery hole in the ground.